Welcome to the website of OzHPV. 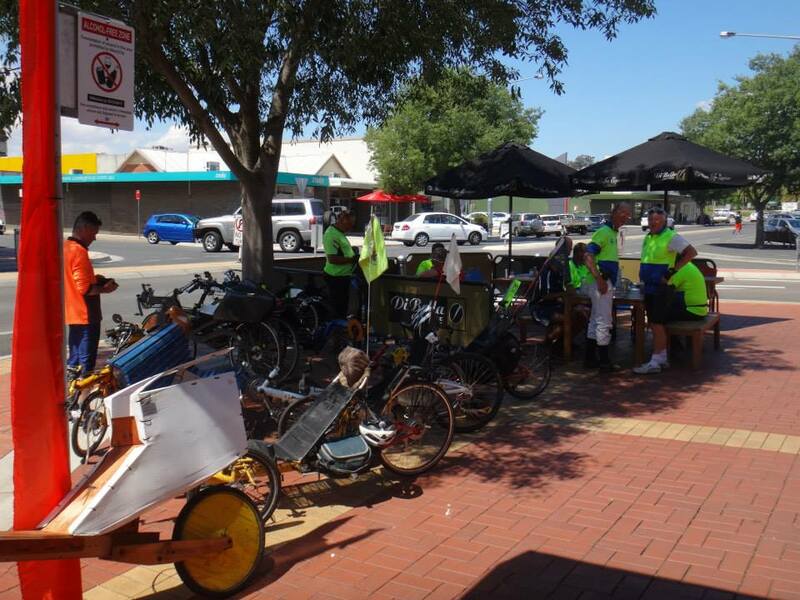 OzHPV is a collection of people in Australia, mainly recumbent cycle riders, who have a keen interest in human powered vehicles (HPVs). We conduct regular social rides as well as national events/rides and publish a regular newsletter. OzHPV was established in 1997 as the Australian association for recumbent and human power enthusiasts. OzHPV is the Australian affiliate organisation of WHPVA, the World Human Power Vehicle Association which represents over 15 countries worldwide. Join or renew membership to OzHPV - It's as low as $25 per year! Membership falls due 1 January each year. Here's Membership Information. You can join online. we encourage ingenuity, and the use of human power, without restriction. At our last committee meeting, Pete Heal nominated for the OzHPV treasurer position, and was supported unanimously. We welcome Pete back to the executive of OzHPV! This marks the first time in recent years that OzHPV has had a full executive committee. As always, we welcome those who seek to contribute and offer service to our community. It can be as simple as organising a ride for a few of your mates, and then letting us know so anyone else that's interested can join in. Have some great ideas? Get involved, make it happen! And bring everyone else along for the ride. The OzHPV AGM and Annual Rally were held last weekend (1st and 2nd December) at Rutherglen. Members enjoyed the various rides on offer put together by Richard Ferris. Steve Nurse took many great pics over the weekend and has made a post on his blog spot Modular Bikes. During he AGM Steve stood down from the Committee and the position of HUFF editor. Steve has been a long standing committee member filling various executive and general positions and has worked tirelessly for the last 5+(?) years putting HUFF together, we thank Steve for his extended service to OzHPV. General Committee: Dome Deli, Simon Watt, William Reid. For the full report, stay tuned for the next HUFF newsletter! The SGM was held as planned on Saturday 6th October at 5:30pm at the Belmont Criterium Track Pavillion. The motion to update the OzHPV constitution was passed unanimously by all members present. Our updated constitution can be found here. OZHPV Inc. will be holding a general meeting on Saturday 6th October at 5.30pm at the Belmont Criterium Track pavillion, (1 Barwon Heads Rd, Belmont VIC 3216) to propose a special resolution to change the OZHPV Constitution. For a special resolution to pass, 75% of the members attending the meeting or voting by proxy must vote in favour of the resolution. 4. changing the proxy voting system so that all proxy votes can be provided to the secretary. If members are unable to attend they can give a copy of the attached proxy form to someone who will be attending the meeting to vote on their behalf. A member cannot hold more than 5 proxy votes (10% of total members). Please do not email your proxy votes to the president, secretary or treasurer email addresses. Entry fees are as always, amazingly cost effective, and range from $10-$80 depending on how much racing you want to do. The Challenge will be held at the Belmont Criterium Circuit, a challenging yet rewarding circuit in Geelong. Practice will be available Friday 5th October, with Racing Saturday and Sunday. Saturday events will be speed based and a Speed Champion crowned Saturday eventing, followed by an SGM to vote on the proposed changes to the constitution listed below. Sunday will feature Most Practical Vehicle Races, with Australia's most practical vehicle and Grand Champion awarded Sunday early afternoon on completion of all events. Richard is currently busy arranging the OzHPC annual rally to be conducted in the Rutherglen area, just south of the Murray river. The AGM will be conducted in conjunction with the weekend, at this stage nominate for late november/early december. Dates will be advised when the weekend is locked in. The proposed changes to the constitution are detailed here. In line with our existing constitution, the secretary will email notice of a general meeting to vote on the updated regulations early in September, proving 28 days notice of a General Meeting to be held in conjunction with the 2018 Challenge to formally vote on the matter. Please contact Richard at treasurer@ozhpv.org.au if you are interested. You may not know, but the positions of President and Secretary are currently vacant. If anyone is considering taking up one of these positions but is hesitant or uncertain about what is involved, you can always first take up a general committee position with a view to nominating for president or secretary at the next AGM. Please contact Richard Ferris at treasurer@ozhpv.org.au if you are interested. Congratulations to Graham who won the 2017 OzHPV challenge. Graham demonstrates that consistency across all events is key to performing well overall in the championship event. Well done to all who made the trip and made the weekend and enjoyable event. The 2017 OzHPV Inc. AGM will be held at 7pm Saturday 9th December 2017 at the Koolamurt Scout Camp, 44 Mandurang Road, Spring Gully, Bendigo. All committee positions are open for election – President, Secretary, Treasurer and general committee positions. We also need a new Webmaster and a new HUFF Editor. OzHPV Challenge 2017, Bendigo, December 7 - 9. The OzHPV Challenge is ON! Download the entry form here (PDF 161 kB). Location and Transport: The Challenge venue is Bendigo, Central Victoria, serviced by train from Melbourne, Swan Hill and Echuca. Bicycles can usually be accommodated on trains but longer HPVs may not be accepted. From the station, the Tom Flood Velodrome is 1km and the Koolamurt Scout Camp is 4km. Catering and accommodation is available through OzHPV and Koolamurt Scout Camp, 44 Mandurang Road, Spring Gully, Bendigo. The camp has areas for tents and basic facilities including showers, bunk beds in a dormitory and smaller rooms to accommodate families of 4 - 5, however it is on a hilly slope and is not wheelchair friendly. Accommodation is available Friday and Saturday nights, but until Saturday night you will need to cater and clean up for yourself in the scout camp kitchen or eat out (Bendigo is 4k away and Spring Gully pub and restaurants are 1k away). Catering from Saturday night includes two course dinner, supper, full breakfast, packed morning tea and lunch for Sunday, with coffee, tea and fruit available at all times. • Bookings and Payments for Catering and Accommodation through OzHPV Inc. must be made by the end of Thursday November 30, 2017 to allow Koolamurt Scout Camp to make adequate preparations. Race Entry only till 12 Noon Saturday December 9. • Please bring a sleeping bag and pillow, the scout camp does not provide bed linen. • If you are vegetarian or have special dietary requirements or allergies, please list them on the entry form. OzHPV became an incorporated association on 12 May 1997. That means this is the twentieth birthday year for OzHPV. It’s ironic that enthusiasm seems to be at a particularly low point going into what should be a high point of the association’s history. We struggle to get members to come to the annual rally, volunteer for committee positions and generally to come on organised OzHPV events. So what big event should OzHPV be organising for 2017 to celebrate reaching 20 years and are you going to support it? New Australian HPV Records Ratified! Kyle Lierich: 77.301 km travelled in 1 hour from a standing start. (Australian men’s 1 hr record). More information on Australian records can be found here. Members can send their contributions to our newsletter editor Steve Nurse. Steve is not a Facebook user so emails to huff@ozhpv.org.au will get to him. Manpower #1 1982 (PDF 1.19 MB): Describes the formation of the Australian HPV Association (4 pages) and includes a fascinating article on streamlining. HPV Times #1 1990 (PDF 587 kB): This is the first edition of HPV News, and has articles about the ACT HPV challenge, practical vehicles and the development of the BLUEBELL HPV. HPV Times #2 1990 (PDF 750 kB): 23 pages that include articles about the Zipper Car-cycle, 1990 World solar challenge and NSW energy challenge. HPV Times #3 1991 (PDF 2.99 MB): A special trike issue (28 pages). HPV Times #4 1992 (PDF 2.75 MB): Articles on utalitarian cycles, letters to the editor and more (32 pages). Laid Back #1 1994 (PDF5.9 MB): Articles on 24 hour records, a tour of the Nullarbor, 1994 Australian HPV championships and more (22 pages). Laid Back #2 1995 (PDF3.8 MB): Articles on the World HPV championships, what's on and "My HPV", and more (28 pages). A cool, humid morning with an overcast sky greeted riders as they arrived at Howlong Bakery for the inaugural OzHPV Howlong Bakery Ride on Sunday 3-Jan-16. Being predominantly flat, the course is recumbent friendly as it travels anti-clockwise through Rutherglen, Chiltern and Barnawartha on quiet country roads, taking in scenic vistas of local farmlands, wineries and the Mt Pilot ranges. 8am and we're off, heading out of Howlong to the bemusement of some locals out getting their morning paper, milk & loaf of bread. The first 10km or so has a few gentle rolling hills but after that it's flat all the way into Rutherglen. Add to that mix a stonking tailwind and you end up with a very fast average speed and happy, smiling recumbenteers. Riders were certainly looking forward to the first planned stop at the Rutherglen Bakery, choc full of goodies loaded with caffeine and sugar, as unfortunately, the Howlong Bakery wasn't open for business prior to our departure. Some time later, it was time to continue the morning's journey, leaving Rutherglen on the main Rutherglen-Chiltern Rd. The first half of this section runs past local grazing land, while the last half includes a few hills through sections of the Chiltern-Mt Pilot National Park. Fully fuelled, riders headed off into what was now a fairly stiff cross-headwind. Temperatures were still cool but starting to rise which added to the humidity. The local Rutherglen bunch was encountered 3km out as it rode past fairly rapidly on its way into Rutherglen, most probably heading for the bakery. Few cars were encountered which added to the enjoyment of this section of the ride, as did the fast descents down the hills leading into Chiltern. Chiltern Bakery was now a sight for sore eyes and tired legs, sapped dry from the efforts of climbing the hills into town. The bakery caters very nicely for cyclists, with several bike racks outside and a full puncture repair kit sitting inside. Not to mention all that yummy goodness in the form of coffee, pasties and chocolate hedgehogs. Being closer to 10.30am, Chiltern was slightly busier than Rutherglen but the local motorists gave plenty of room and seemed quite amused (bemused?) to see such wonderful machines passing through their town. The next section of the ride headed for Barnawartha on the route of the Old Hume Hwy. Tree-lined, this road is absolutely fantabulous to ride on. The first 2km is steadily uphill, but the remaining 7km is all slightly downhill, making for an effortless and very scenic ride. There were signs of a small bushfire about 2km from Barnawartha, with evidence of fires reaching up to the verandahs of some houses. Yikes! The decision was made to continue riding through Barny, turning left at the roundabout onto the recently sealed Soldier's Rd. This now offers a more scenic and less-trafficked route between Barnawartha and Howlong compared to Gooramadda Rd, which is frequented by grain and cattle trucks, caravaners and the odd bogan ute driver - sweet mate! The final run back into Howlong along Chiltern-Howlong Rd is reasonably flat and ended up being fairly uneventful. Back before 12 noon, all who rode the inaugural OzHPV Howlong Bakery Ride really enjoyed riding the course and look foward to the next edition of this classic ride! 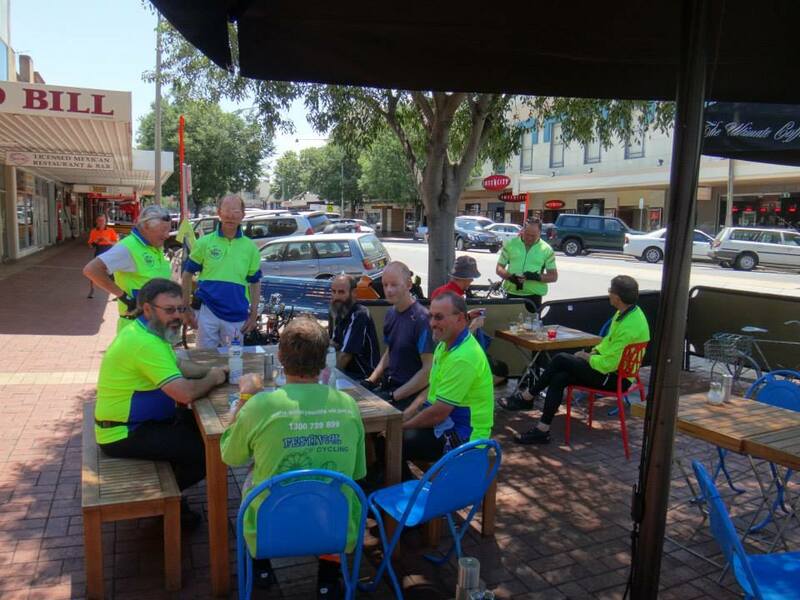 For a few days I have been back from Albury and Lake Hume, after a weekend spent up there riding my bike with fellow recumbenteers and attending the Ozhpv Annual General Meeting. I hadn't been going to go, but there was a prospiracy which made me! A few weeks before the event, I was retrenched from work, which brings with it "slightly more flexible attendance requirements", so I took the Friday off before the event, which coincided with the start of the Great Victorian Bike Ride in Albury. Of course, the GVBR completely dwarfs the OzHPV gathering, so I took an early train, hoping to avoid bike traffic on the train. As it happened, I did avoid the bike traffic, and saw and spoke to only a few early arrivees, taking their bikes up on the train. One of these was Anthony, who I'd chatted to on the way up. 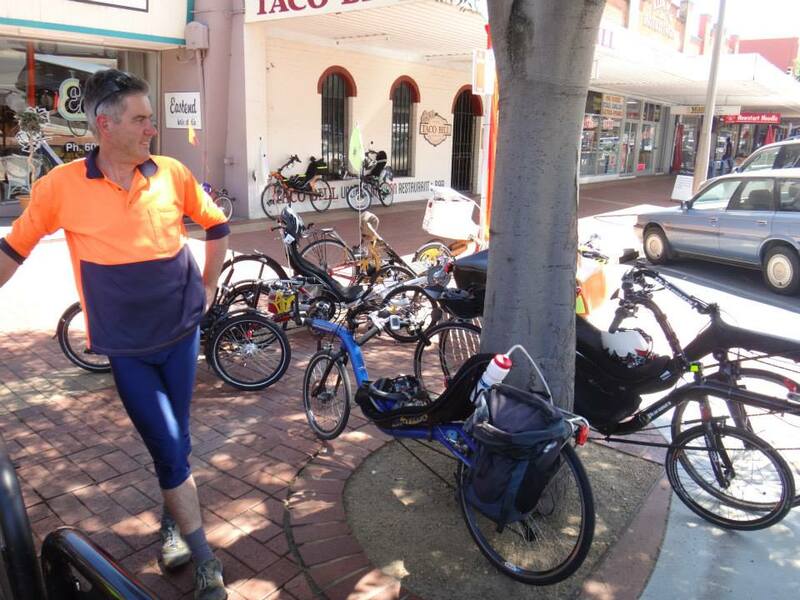 He is a teacher from Bendigo, had a big touring rig, and was setting out from Albury for a few days independent riding. His plan was to catch up with some of his pupils who were doing 1/2 of the GVBR, starting in Mansfield. With a bit of time to kill, I decided to ride out to Lake Hume and my camping ground with him. We parted ways at the Bellbridge turnoff but not before taking a few happy snaps. After setting up camp just next to Graham Signiorini, Graham and I rode back in to Albury for the start of a ride organised by Lloyd Charter. A few of the Canberra mob had arrived and passed us by car on the way in, Duncan and Andrew stopping for a chat. 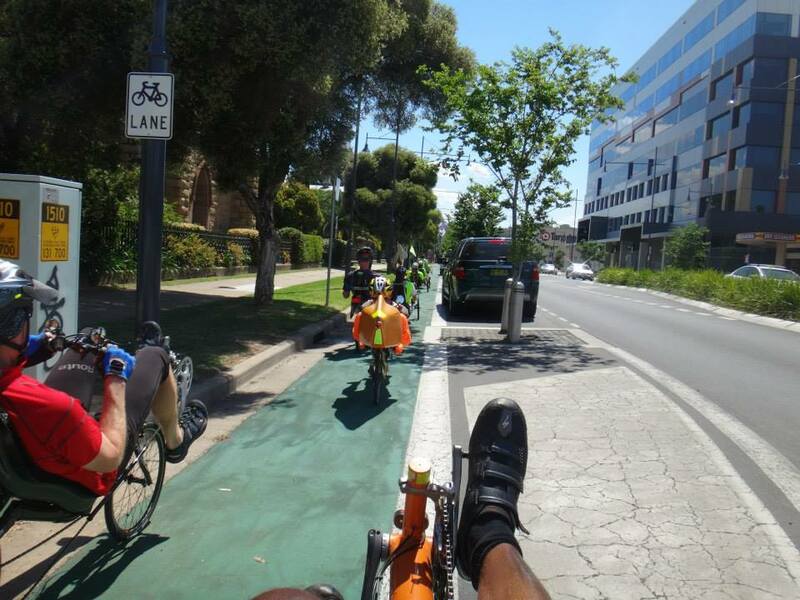 There was quite a big recumbent roll-up in Albury for the Friday ride, Lloyd and 3 of his triking mates, 4 from Canberra, 2 from Melbourne and 1 from Denmark! Michael was in Australia as part of a 2 year world tour, was staying with Pete Heal and had ridden most of the way from his home country.... We went most of the way round Albury on the bike tour, which was buzzing with cyclists in preparation for the Great Vic bike ride due to start in the town on Sunday. There was a 1k long encampment on the Murray full of bike riders, and we even saw the occasional recumbent. Graham and I rode back to Hume village, I was slowing down by this stage but Graham pushed ahead quite quickly, waiting for me every now and then. I arrived at camp and waited for Graham to follow - and waited - and waited. Eventually he wheeled his bike in, and had come across some bindy-eye or other pestilent puncture promoting flora, and had 4 punctures and had fixed 3 of them. He worked on the extra puncture a bit later, eventually fixing it just before we were to head off the next morning. After breakfast the next morning, I lathered on sunscreen, having copped a bit of sun the day before, and Graham and I headed out with Pete Heal and caught the rest of a recumbent mob across the river in Victoria. It was really nice riding on good undulating roads and we passed several groups of Albury upright cyclists off for their 60k or so constitutional Saturday rides. My bike is quite good at bombing down hills, and on a ride like this you get to compare its characteristics with other recumbents. It’s nice to think its fast because its aerodynamic, but it could be that me and my bike are both heavy as well! After a while we hit an unsealed section of the road which had all the evils on it, bumps, drifts of sand, corrugations and hills. Yes, I walked up some of it, this sort of road and my front wheel drive wooden bike being somewhat incompatible, the front wheel slipping and being slightly bothersome. Anyway, that road changed to bitumen again and the riding got smoother with great views over Lake Hume and its abundant birdlife towards Tallangatta. Lunch in Tallangatta, and the Op-Shop was busy and the bakery crowded with motorbiking, recumbent biking, and road biking - daytrip mobs. Standing room only outside the bakery and I bought a plate at the Op - Shop and "The Branch Line, a History of the Wodonga-Tallangatta-Cudgewa Railway" by Lloyd Hughes at another shop. We went on the rail trail a lot of the way back and that was a bit hot and bumpy, Chris Curtis being jolted off and copping a gashed elbow at one point. We regrouped and refuelled in Ebden and from there it was a short ride across the Hume Dam back to the Caravan Park. The day's ride was only about 80k but a bit hot and demanding. A few of us had a swim, almost everyone had a sleep, and the OzHPV AGM was at 6pm. Up early the next morning to pack the tent and get on the 6:30 am train back to Melbourne. It was warm already at 5am when I started riding, and had plenty of time for the train.